Carl Nebel (March 18, 1805 – June 4, 1855) was a German engineer, architect and draughtsman, best known for his detailed paintings of the Mexican landscape and people during the battles of the Mexican-American War. Nebel was born at Altona, today a part of Hamburg. After studies in Hamburg and Paris, he travelled to America, where he was a resident of Mexico from 1829 until 1834. In 1836, he published in Paris his renowned illustrated work on that country—Voyage pittoresque et archéologique dans la partie la plus intéressante du Méxique, with 50 lithographs made from his paintings, twenty of which were hand-colored, and an introduction by Alexander von Humboldt. In 1851, he published together with George Wilkins Kendall some of his paintings of the events of the Mexican-American War in the book The War between the United States and Mexico Illustrated. The book contained twelve color lithographs done by Adolphe Jean-Baptiste Bayot and was printed by Joseph Lemercier – a leading lithographic team of the time. In both cases, Nebel's illustrations were enhanced by his making use of the newest printing developments in France. 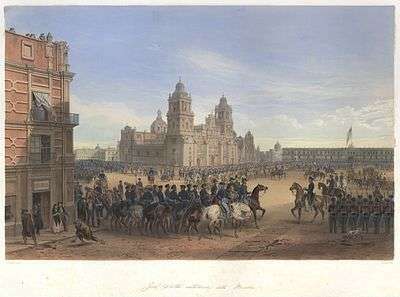 This Carl Nebel painting depicts Winfield Scott entering the Plaza de la Constitución during the Mexican American War. The U.S. flag is flying over the National Palace; the Metropolitan Cathedral is in the background. The Battle of Vera Cruz. The Capture of Monterrey, after a Nebel painting. 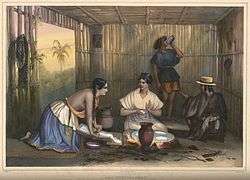 The hacienda owner and his mayordomo (painting by Carl Nebel, litografía de Lemercier y Lassalle). 1 2 Thieme-Becker, entry "Nebel, Carl"
↑ D. Sloan Rare Books: Auction 22: Nebel, C[arl], "Voyage pittoresque et archéologique dans la partie la plus intéressante du Mexique". URL last accessed 2008-09-16. Aguilar Ochoa, "The Visual Adventures of an Itinerant Painter" in Artes de México. No. 80, "Carl Nebel: Nineteenth-Century Itinerant Painter", August 2006, pp. 67–70. Diener, Pablo. "Picturesque Mexico" in Artes de México. No. 80, "Carl Nebel: Nineteenth-Century Itinerant Painter", August 2006, pp. 74–77. López Luján, Leonardo. "Mesoamerican Archeology in Carl Nebel's Work" in Artes de México. No. 80, "Carl Nebel: Nineteenth-Century Itinerant Painter", August 2006, pp. 70–74. Mayer, Roberto. "Bibliographic Curiosity" in Artes de México. No. 80, "Carl Nebel: Nineteenth-Century Itinerant Painter", August 2006, p. 80. Orellana, Margarita de. "Views from Afar and from Up Close" in Artes de México. No. 80, "Carl Nebel: Nineteenth-Century Itinerant Painter", August 2006, p. 66. Tyler, Ron. "A Great American Book: The War between the United States and Mexico, Illustrated" in Artes de México. No. 80, "Carl Nebel: Nineteenth-Century Itinerant Painter", August 2006, pp. 77–80.